Most religions have designated times of the year for fasting or feasting – Orthodox Christianity as practised in Cyprus is no exception. One of the earliest Christian countries, St Paul and St Barnabas journeyed to Cyprus in 45 AD to spread the word. Greek Cypriots take Lent very seriously, Many people fast, avoiding meat, and Easter is bigger than Christmas here. Churches are full, eggs are dyed red, tables are laid, bulging with special foods, especially lamb souvlaki. There are strong links between Cyprus and Britain; conveniently the same 3-pin plugs are used, and they drive on the left. I’m old enough to remember, post-1974, the sudden influx of Greek and Turkish Cypriot children to North London schools. Suddenly my school mates had names like Costas! North London, particularly Haringey, still has many Cypriot shops and restaurants. Sadly the island is still riven in two parts since the Turkish invasion. Fertile Cyprus grows wheat, barley, olives, olive oil, vegetables. It has citrus, a different type for every month, for 10 months of the year and nut trees are pink with clouds of blossom during Lent. 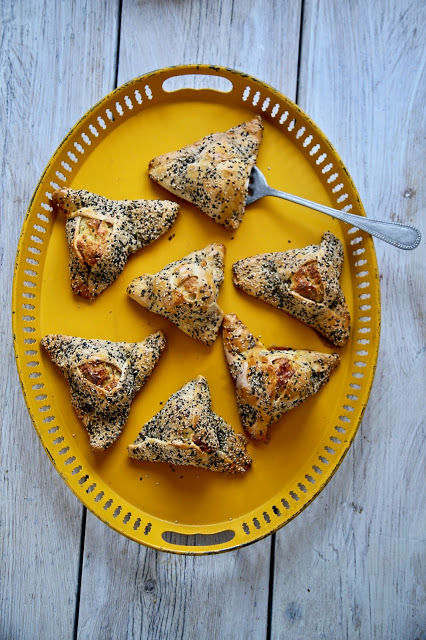 Here are two recipes: a lenten soup and an Easter pastry using the classic Cypriot cheese, halloumi. 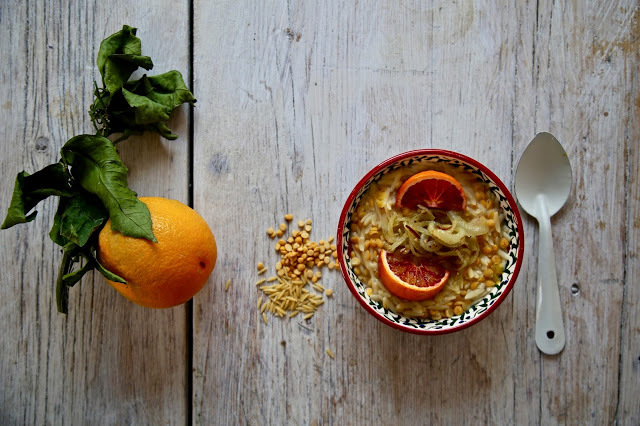 Traditionally this unusual soup is dressed with seasonal bitter orange but I’ve used blood orange or ordinary orange. My version is chunky but you can blend it for a smoother soup. Cook the pulses in boiling water until soft, skimming off any foam. Then add the vegetable stock and orzo. Gently fry the onion (and bitter orange peel if chosen) with the garlic cloves, salt and pepper in olive oil until light golden. To serve, squeeze the orange juice into the soup, check seasoning and add a dollop of fried onions to each bowl. 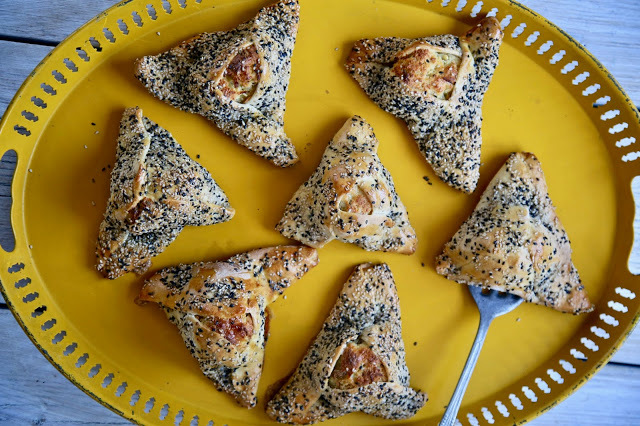 These cheesy pastries are usually triangular, representing the trinity. It uses a couple of unusual ingredients: mastic or mastiha, a tree resin from the Greek island of Chios; and Mahleb, a bitter cherry stone ground into a powder. For authenticity, you can also add a little of these ingredients to the filling but it’s not absolutely necessary. Grate both cheeses into a large bowl. 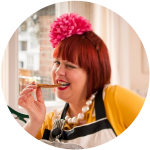 In a separate bowl, mix the plain flour, semolina, yeast, dried mint and sultanas together. Beat the eggs and milk together in another bowl. Mix all 3 bowls together with your hands. This can be left overnight. Add the baking soda to the filling and put aside. To make the pastry: mix together the flour, mastic powder and mahleb. Add the sugar, salt and yeast. Add the butter and milk, making a well in the centre of the flour. 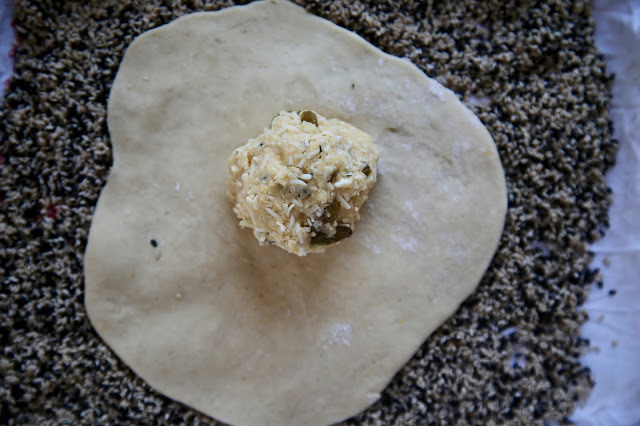 Combine the ingredients to form a soft dough. Knead until smooth by hand or with a stand mixer. Return to the bowl, cover and leave to rest for an hour. In a small pan, cover the sesame seeds with water and a dash of vinegar. Remove from the heat, strain and spread the seeds over a clean tea towel to dry. Line a baking tray with a silpat or baking parchment. Divide the pastry into 6 or 7 large pieces and roll out on a lightly floured work surface into 12 cm circles. 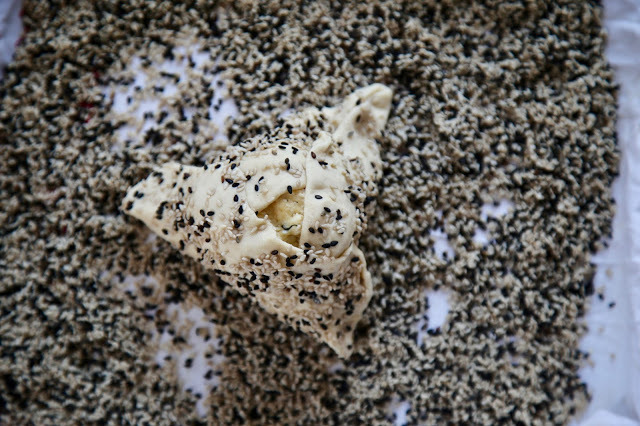 Press the unclouded side of the round into the sesame seeds. Divide the filling into 6 or 7 balls and place one in the centre of the round pastry. Fold in 3 sides to make a triangle shape, leaving a gap in centre with the filling exposed. Place the flaounes on the baking trays, brush the tops with the beaten egg yolk and bake for 30 minutes. Serve hot or cold. Previous Post: « Rural Cyprus: what to eat and drink, where to stay.